GB0026. 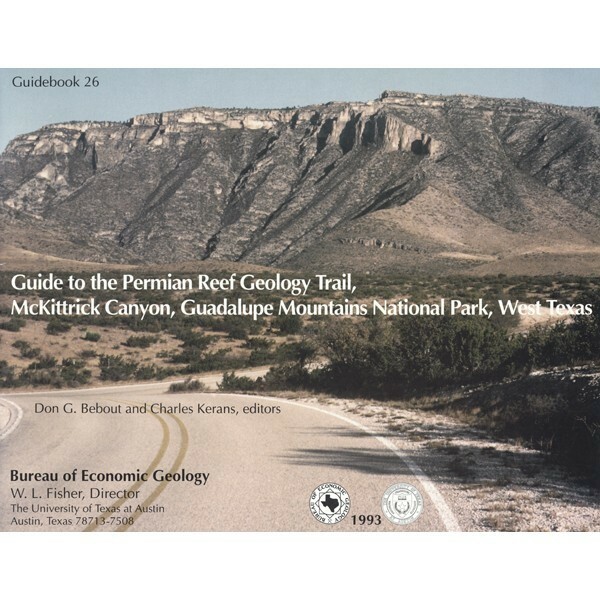 Guide to the Permian Reef Geology Trail, McKittrick Canyon, Guadalupe Mountains National Park, West Texas. D. G. Bebout and Charles Kerans, Editors. 48 p., 46 figs., 1993. ISSN: 0363-4132. Print. The Permian Reef Geology Trail in Guadalupe Mountains National Park traverses 2,000 vertical ft (5,000 to 7,000 ft) of upper Guadalupian facies, through one of the world's finest examples of a rimmed carbonate platform. The guidebook's text presents the geology along the trail, keyed to marked stops, and includes measured sections, color photographs, and aerial photomosaics. Offered for sale both at BEG and at national parks in West Texas, this popular guidebook is often used by hikers and campers as well as by groups of teachers, students, and professional geologists. Bebout, D. G., and Kerans, Charles, editors, 1993, Guide to the Permian Reef Geology Trail, McKittrick Canyon, Guadalupe Mountains National Park, West Texas: The University of Texas at Austin, Bureau of Economic Geology, Guidebook 26, 48 p.